The chairman of Metro's board of directors says employees may have to be fired following the derailment near the East Falls Church Metro station last week. "I'm outraged. These things shouldn't be happening," Jack Evans told News4. At least one person was hurt when two rail cars on an Orange Line train jolted off the tracks at a crossover point near the station and derailed. The NTSB released its preliminary findings on the incident, saying the tracks where the train derailed on Friday were in "severe" disrepair. The distance between the tracks in the area was nearly 2 inches wider than the standard set by Metro, according to the NTSB. Many people, including Evans, wonder why routine track inspections did not identify the problems. "I thought by this point, after everything that [Metro General Manager] Paul Wiedefeld has said about people taking their jobs responsibly and doing what they are supposed to do, that we wouldn't have things like this happen," Evans said. Investigators also noted a "severe defective tie condition" in the area where the train derailed, and more than 30 feet of track had defective rail ties, confirming what WMATA found in its own investigation. No information has been released on when this section of track was last inspected. "I would encourage the general manager to find out who was supposed to be doing [the inspections] and then fire them," Evans said. Metro has not commented on whether anyone will be let go in connection to the derailment and has said the investigation is ongoing. 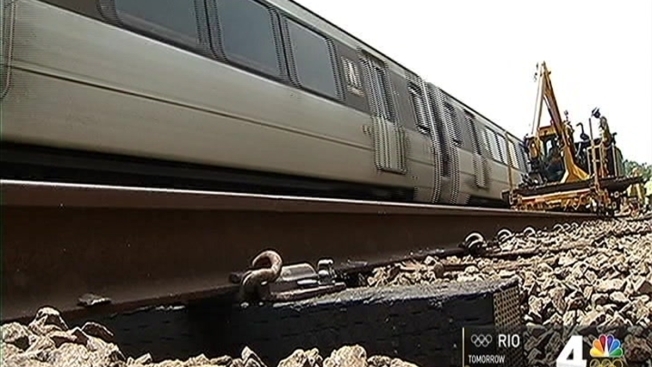 In response to investigations, WMATA said it will now include crossover tracks in its regular automated inspections, and the crossovers will be inspected twice weekly, as is required by Metro's standards. The NTSB says it is still investigating what caused the derailment. In the meantime, Evans is animated and upset. "I'm furious about it, to be honest with you. It's very hard for me to go out and try to get more money for this system when we have these crazy antics happening," he said. "It's like the train under my Christmas tree jumping the track. How does that happen?" Evans said he may call a special meeting of the Metro board of directors this month to get a briefing on safety. "As the chairman of the board, I feel a little disconnected from what's happening, because there seems to be something happening every day," he said.